The Asian Games, as with the Olympics, are played over three days. On the opening day eventual finalists Japan and China were already showing their class, ending as the only two sides to achieve two wins from two beating Indonesia and Kazakhstan, and Korea and Hong Kong respectively. Japan had five different try scorers in their important pool 31-21 win over likely medal rivals Kazakhstan, but the day’s biggest win went to China as they won 69-0 against Korea in the first game of the competition. Keyi Chen, who played a pivotal role in helping China qualify for next season’s World Rugby Women’s Sevens Series scoring a hat-trick in the win. On the second day defending gold medallists China continued their impressive form. Topping their pool after beating Singapore 41-0 they met hosts Indonesia in the quarter-finals, blowing them away 43-7 with Keyi Chen scoring a first-half hat-trick. Kundyzay Baktybayeva scored a brace for Kazakhstan as they beat Singapore 34-0 in the second quarter final to set up the match with China on the third and final day of competition. In the only unexpected result Thanaporn Huankid, Piyamat Chomphumee and Chitchanok Yusri scored the tries as Thailand beat Hong Kong 17-5. Japan also completed a 100% record in the pools, Singapore 41-0 before seeing off Korea 35-5 with seven different try scorers in the match. 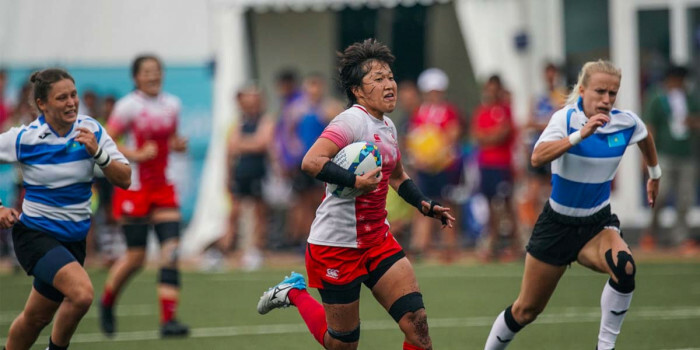 The final day began late after a dispute over resheduling, but once it was underway Chen scored her ninth and 10th tries of the Games as China beat Thailand 29-5 before Hirano scored her fifth with Japan booking their place in the final with a 26-12 win over Kazakhstan. Kazakhstan won their second successive bronze at the Asian Games with a 17-7 win over Thailand thanks to two first-half tries from Lyudmila Korotkikh and two second-half tries from Kundyzay Baktybayeva, having won gold in the inaugural women’s event in 2010.